We have both always been fond of cats. Please only look at these pages if you are likely to be interested in them. These two cats were our companions for sixteen years. We were very attached to them, and miss them now they are gone. To see more about them visits Merry and Pippin's Page. Pippin was found in a cardboard box, abandoned. Our neighbour bought him to us, asking what should be done with him. We were not ready for a new cat, but the neighbour offered us a lift to go and get all we needed. When he snuggled up to us, we could not turn him away. He was a very trusting cat. The photograph shows him several years later looking out of the back door. 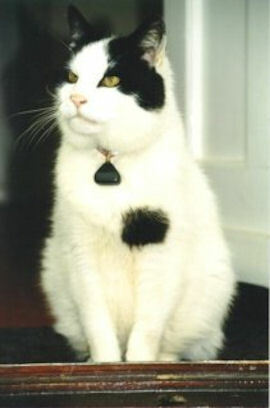 This was also a favourite pastime of his companion cat, Merry, below. Merry was the last cat in her litter to find a home. Her owners were very keen for her to have a new home quickly. So we took her in, even though at that time she did not look very pretty. It turned out that she had the most beautiful nature, the best sort of beauty. 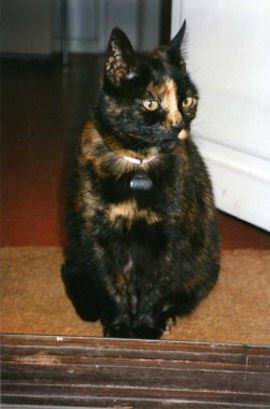 She was a very affectionate cat, who loved a cuddle. Our current cats are brother and sister. They are rescue cats who have been with us for about eight years. They are full of character and great fun, although they do not sit on our laps or give us cuddles. Still we love them both. You can see more about them on Willow and Flora's Page. Over the years there have been other cats we have cared for, and favourite cats that we have met. Here is just a little about a few of them.